We’d love your help. Let us know what’s wrong with this preview of Fakers by H.P. Wood. In this era of daily online hoaxes, it's easy to be caught off-guard. Fakers arms kids with information, introducing them to the funniest, weirdest, and most influential From the Trojan horse to fake news, scams have run rampant throughout history and across the globe. Some con artists do it for fun, others for profit. . . and every once in a while, a faker saves the world. To ask other readers questions about Fakers, please sign up. Whether your interest is in short cons, heart-string pulling scams, mind-bending spoons, carnival games, science, medicine or war, FAKERS makes sure to touch on it all. Additionally, it does so with a modern sensibility. For example, P. T. Barnum is called out for using an enslaved woman as a side-show and pocketing money meant to help free her grandchildren. And "fake news" is pointed out as a convenient phrase when news is less than flattering. The trends on social media and bots are also conn Whether your interest is in short cons, heart-string pulling scams, mind-bending spoons, carnival games, science, medicine or war, FAKERS makes sure to touch on it all. Additionally, it does so with a modern sensibility. For example, P. T. Barnum is called out for using an enslaved woman as a side-show and pocketing money meant to help free her grandchildren. And "fake news" is pointed out as a convenient phrase when news is less than flattering. The trends on social media and bots are also connected to the idea of decrying "fake news." From conjurers, mystics and magicians, to schemers, imposters and internet scammers, this is something that's better to read about than experience. 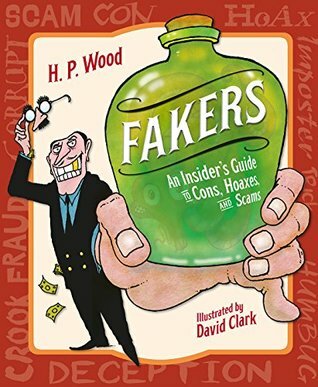 Wood delves in at the very beginning (yes, cave men) and recounts famous - and infamous - hoaxes and scams. The Trojan Horse, the Spanish Prisoner, the shell game; long cons, carnival games, and Ponzi schemes are all explained and exposed. Wood has offered a very entertaining and informative collection; whimsically illustrated, and full of sidebars and pictures. An important chapter at the end gives advice on avoiding internet scams and cons directed at college students. Includes a bibliography, and source material. Students will enjoy this, it will make them feel smart and hopefully less gullible. With a tongue-in-cheek style, this book is a great look at scams (including magic) throughout history--including how they happen online. Plenty of history and good information. This was a Junior Library Guild selection, and I can see why they chose it. Appropriate for teens through seniors. I rarely give a 5, but this book earns it. Very detailed and interesting. Up to date on the scams. This is one of the most interesting books I've ever read, and I enjoyed it! I learned so much about fakers throughout the years, and it's quite fascinating. Such a good read! Students will enjoy this, it will make them feel smart and hopefully less gullible. For my full review, visit http://kissthebook.blogspot.com . CHECK IT OUT!